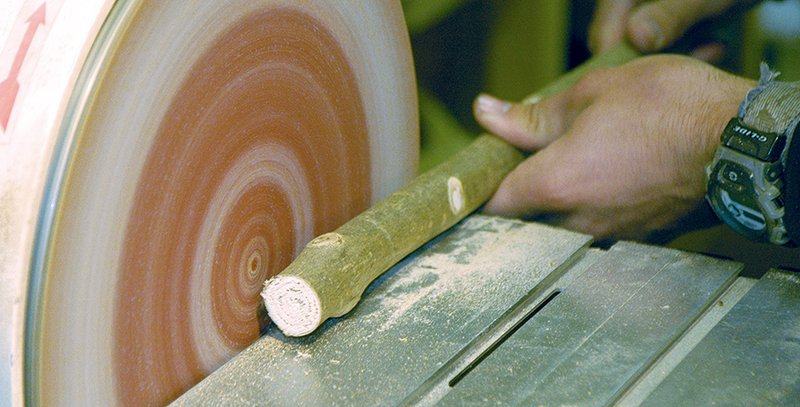 Classic Canes produces rustic walking sticks in its Somerset woodland using the centuries-old forestry technique of coppicing. Native British hardwoods such as ash, hazel and blackthorn are cut off to a height of approximately 120cm from the ground. New shoots result and take three to four years to grow to the correct diameter for walking sticks such as hiking staffs, thumbsticks and knobsticks. The wood is harvested in the winter when the sap is down in the trees, before being dried for at least a year to remove the moisture from the wood. The sticks are then steamed and straightened before being hand sanded, varnished and fitted with ferrules to become finished walking sticks. Each one is unique. Coppicing has many ecological benefits. The wood constantly renews itself so there is no need for clear felling or replanting. The system allows light to reach the forest floor, encouraging native wildflowers and the fauna that depend on them. In spring, carpets of English bluebells flower: one of the great sights of life at Classic Canes.